Under new funding to ACT's ECLIPS Engineering, diesel generators could soon be replaced by rapid, redeployable solar PV systems to provide a temporary power supply for military operations or disaster relief efforts. 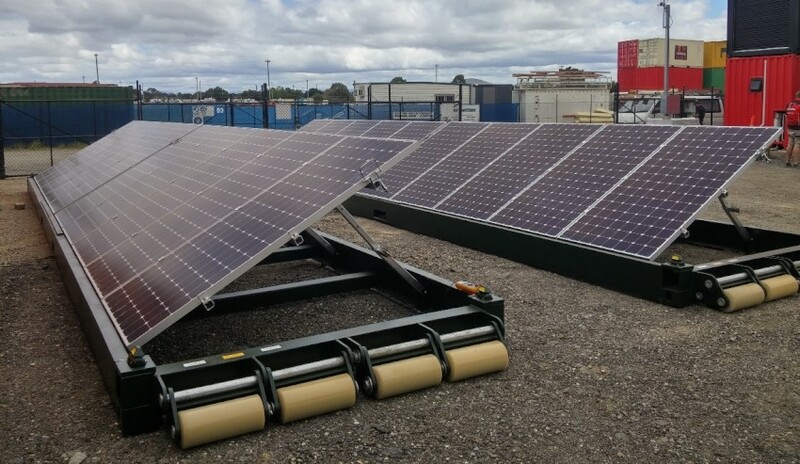 The Australian Renewable Energy Agency (ARENA) has announced $289,725 in funding to ECLIPS Engineering to design, manufacture and test their redeployable Container Roll Out Solar System (CROSS). CROSS is a factory assembled, relocatable solar array that has been developed to reduce the logistics challenges associated with deploying solar PV generators. Designed to fit inside a standard shipping container, the CROSS units can be stacked up to seven units high. ARENA said the $703,468 total project opens up markets not previously available to the renewables industry, including defence, disaster recovery, humanitarian, construction and temporary network augmentation. The systems come available in 20-foot and 40-foot configurations, with a maximum output of 2,175W and 4,350W respectively. CROSS can be unloaded and setup in minutes, ready for connection to an inverter. ARENA CEO Ivor Frischknecht said the CROSS units provided new opportunities for solar in Australia. "CROSS units offer immense benefits in being able to be deployed in off-grid and fringe-of-grid areas, and even have the potential to offset diesel consumption and improve the security of existing networks," Frischknecht said. "These renewable options can reduce some of the barriers to entry for potential renewable power users in remote locations, including short project durations and where power systems need to be periodically relocated." ECLIPS managing director Shaun Moore said that the original objective for CROSS was to improve power self-sufficiency for Defence Users. “One of our early objectives was to provide rapidly deployable utility scale PV generators to improve the self-sufficiency of Defence’s deployed forward operating bases," Moore explained. "Diesel consumption related to the provision of electricity can account for up to 70 per cent of deployed forces fuel usage and is a significant cost driver. More importantly, deploying CROSS to forward operating bases also reduces the frequency of convoys for fuel resupply, which reduces the threat to soldiers in contested environments. These same logistics efficiencies and benefits are transferrable to commercial and utility customers in remote areas of Australia."